Simplification and harmonization of trade data and documentary requirements can contribute significantly to the reduction of time and costs for international trade transactions. Harmonizing data used in trade documents and aligning them with international standards also ensures data interoperability among the various parties engaged in a trade transaction. In particular, harmonization is a necessary step toward trade automation and the introduction of electronic Single Window facilities, where all trade-related information and data should be submitted only once so that repetitive keying of the same data can be reduced. 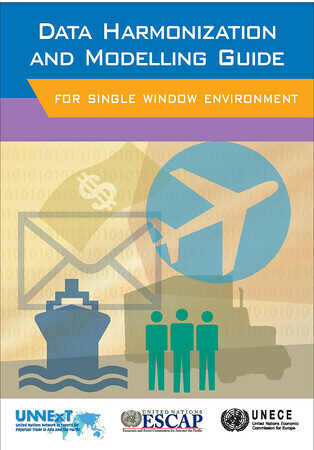 This UNNExT Data Harmonization Guide for Single Window Environment is developed as a tool to assist governments and businesses in harmonizing and standardizing the international trade data required in fulfilling all import, export, and transit-related regulatory requirements through the elimination of redundant data and duplication in exchanging and recording information. This Guide provides a step-wise approach on how to conduct a data harmonization exercise and a basic concept for assembling electronic messages. The steps described in the Guide are based on the experience gained from national projects, such as the data harmonization exercises. The Guide is intended to serve practitioners, project managers, data modelers, and data analysts from government agencies, the private sector and the business community involved in harmonization and simplification of international trade procedures through harmonization of related data requirements with international standards.